The first cinema theatre in Singapore was built in the early years of the 20th century. Pioneer distribution companies, such as Pathe, screened silent films from Europe and America. By the 1910s, Hollywood films dominated the market. To encourage a movie-going culture in Singapore, film publications, such as Picture Show, were imported from Britain and America. I would like to share some of the early publications (1924-1941) from my personal collection. By the early 20s, films made in China were distributed in Southeast Asia, including Singapore. In conjunction with the screenings, special editions of locally printed publication on these films were usually sold to the public . The Grandson, also known as An Orphan Rescues his Grandfather, was produced in 1923 by Mingxing Film Company in Shanghai and directed by Zhang Shichuan and Zheng Zhengqiu. One of the earliest silent feature-length films made in China, the film was a box office hit and signified the birth of the film industry in China. 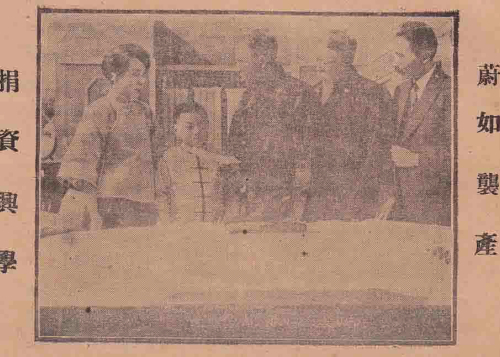 My records show that The Grandson was the first Chinese film to be released in Singapore. 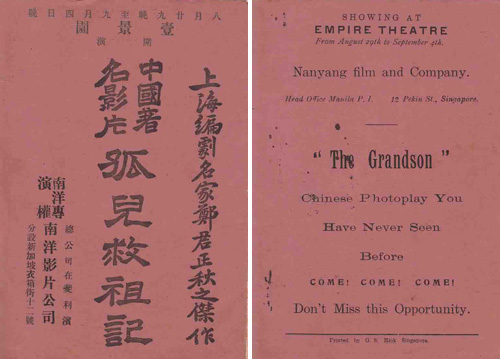 Brought in by the film distributor, Nanyang Film and Company, the film was screened at the Empire Theatre from 29 August to 4 September 1924. The Empire Theatre was located at Tanjong Pagar Road and is now the Fairfield Methodist Church. 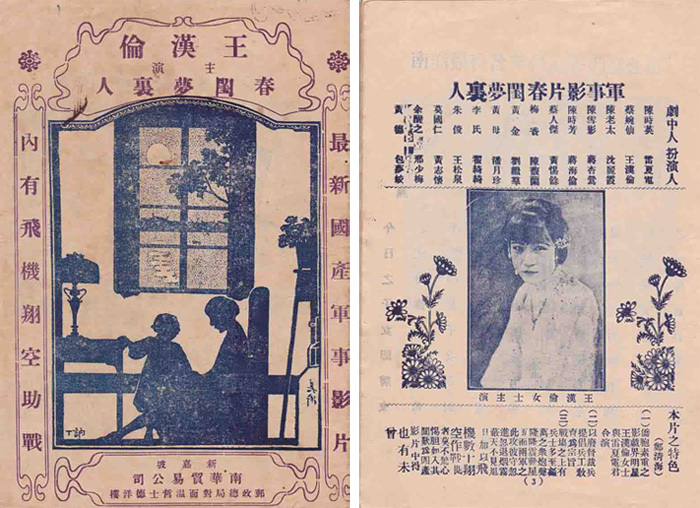 Front cover (left) and back cover (right) of the film booklet printed by G. S. Hiok, Singapore. The 20-page booklet was bilingual with three pages in English that gave a brief synopsis of the film. The rest of the pages in Chinese detailed the story and included some black and white film stills. Made in 1925 by Great Wall Film Company (Changcheng) in Shanghai, The Lovers’ Dream, also known as Between Love and Filial Duty, was distributed by the Nan Hua Trading Company located at 16 Winchester House. This 24-page publication was primarily in Mandarin, except for two pages of synopsis information in English. One of the earliest monthly film publications in Singapore was Picture Book, which I have collected. I hold issues from 1934 to 1938. The publication consisted of news on films, celebrities, film reviews, upcoming film previews, advertisements and other film-related articles. The first issue was published in October 1932. It is not known when the last issue was published, but my guess is it was before the Japanese invasion in 1942. The magazine was sold for ten cents in the Straits Settlements (Singapore, Malacca and Penang) and the Federated Malay States. Outside of these regions, it was sold at fifteen cents. The magazine was published monthly by E. M. Glover & Co. located at 9 & 11 The Arcade, and was printed by the Malaya Tribune Press Ltd. at Anson Rd. All its pages were printed in black and white except for the front covers. Earlier issues of the magazine had 40 pages, while later ones had 48 pages, excluding the cover. Special issues, such as the one for Christmas, had as many as 80 pages. Picture Book mainly covered Hollywood and British films. From the cinema advertisements, one could tell that the films were screening in theaters such as Capitol, Alhambra, Pavilion and Garrick. 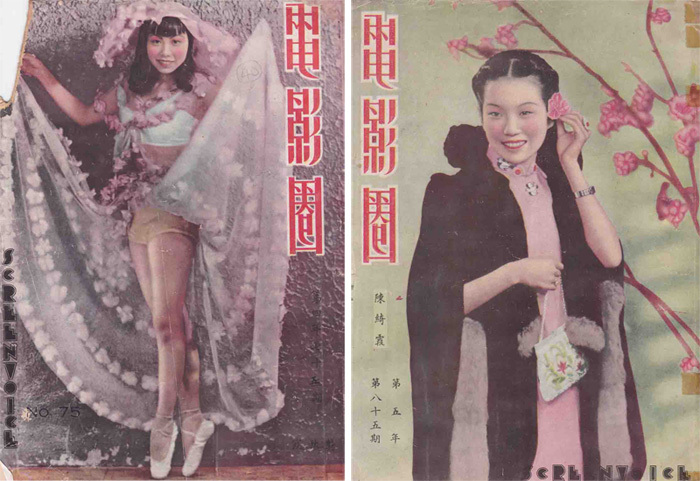 Founded by Sir Run Run Shaw and printed by Shaw Brothers Ltd, Screen Voice was a fortnightly Chinese movie magazine with a first issue on 16th July 1937. Priced at five cents per issue, each issue contained between 20 to 32 pages. The magazine was also distributed in Hong Kong, Shanghai and other parts of Southeast Asia. It mainly featured the Chinese and Cantonese films produced by Shaw’s Hong Kong studios. The Grandson. Dirs. Shichuan Zhang and Zhengqiu Zheng. Mingxing Film Company (Chinese: ??????). Nanyang Film and Company, 1923. The Lover’s Dream. By Hou Yao. Dirs. Zeyuan Li and Xuechou Mei. Perf. Xiadian Lei and Hanlun Wang. Prod. Zhaoming Liu. Great Wall Film Company (Chinese: ??????). Nan Hua Trading Company, 1925. Wong Han Min is an avid private collector of film memorabilia. His collection has been widely exhibited in Singapore and overseas. He was a collaborator in Ming Wong’s Life of Imitation exhibition, which was awarded a Special Mention at the 53rd Venice Biennale.